Alienware has once again made a fantastic product – this time a gaming monitor. It looks great, both from a design point of view and in use, and will make an excellent addition to the desk of any serious gamer. The Alienware 25 Gaming Monitor AW2518H is the first gaming monitor from the well-known PC gaming brand, and if you’ve kitted yourself out with one of Alienware’s impressive gaming PCs, such as the Area 51 Threadripper Edition, then it’s an ideal accompaniment. As with other Alienware products, the Alienware 25 AW2518H combines impressive build quality and gamer-centric features with an attractive design that’s sure to appeal to discerning gamers. With a 240Hz refresh rate, support for either Nvidia G-Sync or AMD Free-Sync technology and a low 1ms response time, the AW2518H ticks many of the boxes that gamers look for in a display – especially if they play fast-paced competitive multiplayer games. For a 25-inch 1080p monitor, the Alienware 25 AW2518H is on the pricey side at $699.99 (£670, around AU$870). However, at the time of writing both the US and UK Dell stores were offering price reductions that lower the price to $599.99 and £550 respectively for the version with Nvidia G-Sync technology built in. However, even with those reductions this is a pricey monitor, and it's more expensive than the BenQ Zowie XL2540, another pro-gaming monitor that concentrates on high refresh rates and low response times, rather than high resolutions and giant screen size. That costs $497 (£430, AU$699). 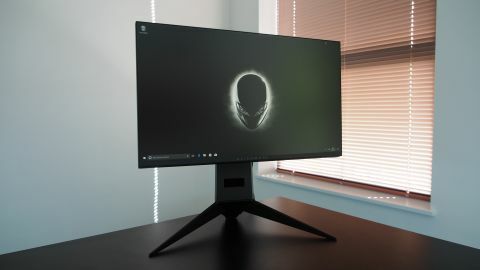 Compared to non-gaming 1080p 24-inch monitors such as the AOC PDS241 Porsche Design, which costs £189 (around $240, AU$320), the Alienware 25 Gaming Monitor AW2518H seems like a pricey proposition. However, if the most important thing you look for in a monitor is speed and responsiveness, then thanks to the impressive gaming tech on board you’ll be well served by the Alienware 25 Gaming Monitor AW2518H. Alienware’s reputation, and Dell’s aftermarket support, also means paying a bit extra for the AW2518H should be a good investment. One thing that immediately grabs you after you’ve taken the Alienware 25 AW2518H out of its box and set it up is how good it looks. It has a black and silver design that takes design cues from Alienware’s other products. Compared to some other gaming monitors the AW2518H appears rather understated, though the sharp angles of the neck and stand make it clear this is no ordinary office monitor. On the back of the screen, three LED lines, along with the Alienware logo, can be illuminated and configured to display a range of colors using the AlienFX technology, which you can sync with your other Alienware products, or even compatible games. This won’t be of much interest for serious and professional gamers, but Alienware is making concessions here to gamers who like a bit of flair with their (expensive) gaming rigs. The BenQ Zowie XL2540 has a much more straightforward design that eschews any superfluous gimmicks, and while that may suit some people, others may find it a bit boring. The Alienware 25 AW2518H strikes a good balance between functional design and flair. The bezels at the sides and top of the screen are impressively thin, which means almost the entire front of the monitor is occupied by its display. It also enables you to position monitors on either side for multi-monitor setups without thick bezels interrupting the view. As usual, the bottom bezel is a bit thicker than the others, and houses the word ‘Alienware’ in a simple yet effective font. At the bottom-right corner of the screen, on the underside of the bezel, are six menu buttons. While this placement is common on monitors, it can sometimes make using on-screen menus tricky. Thankfully, here the design of the on-screen menu makes navigating it using the buttons easy, thanks to clearly labelled symbols that appear on the screen above the relevant buttons. The various ports are hidden away along the underside of the monitor. These comprise a power connector, DisplayPort, line-out audio port, USB port, headphone jack, three USB 3.0 ports, a USB upstream port (for connecting the monitor to your PC) and HDI. This is a good selection of inputs, although older connections, such as DVI, are absent. Overall the Alienware 25 AW2518H is a very nicely designed monitor that looks great on a desk, without being too overbearing, as some gaming monitors have a habit of being thanks to their garish designs. The Alienware 25 Gaming Monitor AW2518H is easy to set up, with no tools required. While the 1080p TN display may not be as initially impressive as larger monitors with higher resolutions, it’s also clear that the AW2518H provides excellent image quality. Black and white levels are excellent thanks to the 1000:1 contrast ratio, while colors were vivid and accurate. Viewing angles are a bit of an Achilles' heel for TN panels, and so it proved here, with color and vibrancy fading when the monitor is viewed from perspectives other than head-on. Due to the size of the screen, it’s unlikely that you’d buy the Alienware 25 Gaming Monitor AW2518H to have friends over to watch you playing, but this issue is definitely something worth bearing in mind. During our tests, which included playing the popular PlayerUnknown's Battlegrounds, a game where fast reflexes are essential, the Alienware AW2518H’s high refresh rate (we tested the G-Sync model paired with an Nvidia GPU) and low input lag really shone. They deliver an incredibly responsive gaming experience, and could really give you a competitive edge. There was no hint of screen tearing, and in general the Alienware AW2518H did a fantastic job. Games and movies also looked fantastic on the vibrant screen, so you’re not sacrificing image quality for higher frame rates. However, if you’re used to higher resolutions, the drop to 1080p can sting; if you value graphical fidelity, then you’re better off going for a 1440p or even 4K monitor. Thanks to the improvements in graphics card technology, you don’t have to make too much of a compromise with frame rates if you want to push higher resolutions – although the response time of the monitor may take a slight hit. The Alienware 25 AW2518H is an excellent gaming monitor that plays to Alienware’s strengths. That means you get a gorgeously-designed device that’s also packed full of technology to helps improve your experience when playing. The high refresh rate and low response time makes this an excellent monitor if you enjoy playing online games where quick reflexes can turn the tide of a match, and games played on the Alienware AW2518H feel gloriously smooth, without a hint of screen tearing. The modest size and weight of the Alienware AW2518H also mean this is a viable monitor for e-sports players who want to take their trusted gaming display on the road with them. However, if you’re looking for a monitor that will fully immerse you with eye-popping resolutions and vision-filling images, then you’re better off looking at monitors such as the ultra-wide AOC Agon AG352UCG.